The sky is filled with big, heavy, dark clouds for several weeks now. Every day I wake up to a drizzling sky and it looks so beautiful. Everywhere around me, all I see is lush greens and oh so pretty grasslands and green hills, with rainbows. I spotted two rainbow’s yesterday! I guess it was one lucky day. Today morning, the sky wasn’t drizzling it was pouring! Looking at that beauty, all I could think about was making masala chai and fritters. Enjoying the beauty of nature we are blessed with, I decide not to resist my favorite fritters anymore. Soon I indulged myself preparing the ingredients for the beautiful methi na gota. They are very famous in Gujarat, India. You can find them on all the tea stalls commonly known as nukkad chaiwala. Going back to last year’s rains in India, I was lucky to relive the excitement of soaking in the rain and going to the street food stalls, eating these beautiful bhajji’s with the side of yogurt chutney and masala chai to keep us warm. I relived this with my mom and my two beautiful sister’s. This morning, I felt like reliving that joy and sharing it with the husband. It was absolutely delightful. The fritters are easy to make and all the ingredients are easily available in an Indian Pantry. For Fenugreek Leaves I was lucky to have fresh available but I always keep frozen leaves handy too. The flavor of this herb is utterly scrumptious and I love it. I have tried my hand on making them exactly how we get methi na gota on the tea stalls and I achieved it totally. So let’s jump on to preparing these beauties!! Wash methi and cilantro thoroughly. They might have a lot of dust so it is advisable to wash them thoroughly at least 3-4 times. One washed, chop the leaves and transfer them in a big bowl. Now add the chickpea flour. Add green chilies, peppercorns, hand crushed coriander seeds, sugar, turmeric, and salt. Now start adding water to make the batter. Make sure you add water as needed. Prepare the batter by squeezing the methi and cilantro leaves to release water and flavor from them into the batter. Once the batter is ready, add soda and give it a mix. Now rest the batter for 10-15 mins. In the meantime quickly make the yogurt chutney. For the chutney, you need yogurt, chickpea flour, dry red chili whole, green chilly, mustard seeds, turmeric, sugar, and curry leaves. In a stove-proof bowl beat yogurt and chickpea flour. Add turmeric, salt, and sugar. Add water and give it a mix. Now place it on the stove on a medium-low flame. Bring it to a boil and stir it continuously. Take it off the stove once the raw chickpea flour taste goes away. For tadka, add oil, mustard seeds, red chilies, green chili, curry leaves, a pinch of asafoetida (Hing). Add it on top of the chutney. Serve with hot bhajjis. Put oil for heating. Once the oil is ready, take a spoonful of hot oil and mix it in the batter. It helps in making the fritters crisp for outside and soft from inside. Use a spoon or your hands to place the fritters in the oil. Fry them until lightly golden and take them out. Serve them hot with masala chai, yogurt chutney and lightly spiced onions with red chili powder and salt. Enjoy! 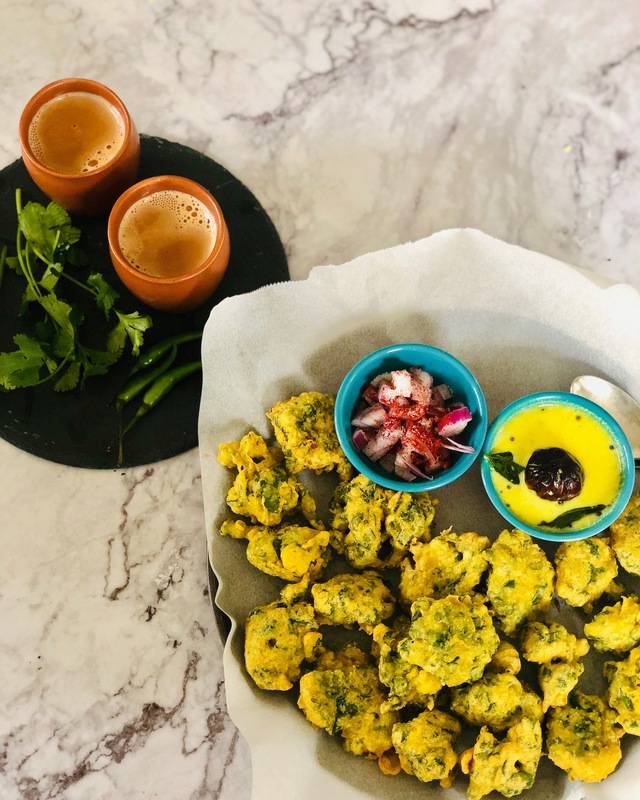 This entry was posted in Tea Time Snacks Recipes and tagged #thegujjutamilkitchen #methinagota #gujaratifood #huffposttaste #indianfoodbloggers #indianblogger #f52grams #storiesofindia #india #indian #ourvadodara. Bookmark the permalink.